This event took place on December 4, 2014. If you missed it LIVE, not to worry – I’ve got the recording of the call available for you! Simply fill out the form lower on this page, click on the link in the confirmation email you will be sent, and the recording will come straight to your email inbox. Be sure to whiteleis admin@lanimuelrath.com and lani@lanimuelrath.com. The call lasted about an hour – and as I checked the recording, I only noted one blooper – in my first mention of Julieanna’s new book in the introduction I called it The Vegetarian Diet, and of course I meant to say The Vegiterranean Diet! 1. What is the premise of The Vegiterranean Diet? What makes your version of the Mediterranean diet unique from the traditional one? Why did you remove the olive oil from the traditional Mediterranean diet? How many recipes and what types do you include? You have a new pyramid and plate you created for the book…what makes them different from the Plant-Based Pyramid and Plate you developed several years ago? Tell us about how you set up your meal plans, because it is not a typical method. What are your thoughts on using a small amount of olive oil for salad dressings? Should we avoid oil altogether or is a limited amount allowed on your Vegiterranean plan? Curious. If the Mediterranean has such a solid history of health and longevity (I’m Mediterranean) why change it? My parents ate a solid Mediterranean diet rich in olive oil and small amounts of meat, dairy, etc. My father lived a healthy life to 93 and my mother to 87. They worked hard and had fairly stressful lives. Not sure a different diet would have better. BTW, I’m a gluten free vegetarian but indulge occasionally when visiting relatives. Fetch the recording NOW by filling out the form below. Always on the lookout for resources to advance your plant-based journey, I invited Julieanna Hever, The Plant-Based Dietitian, to be my special Teleclass guest on Thursday, December 4 – and you’re invited! Julieanna will be telling us all about her new book, The Vegiterranean Diet. Sign up for this no-charge call/webcast below. Even if you can’t make this call LIVE, sign up so that I can send you the call recording. 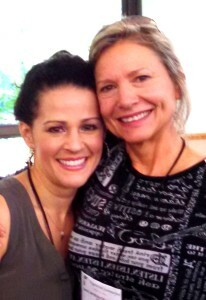 Julieanna and I recently met up at Vegetarian Summerfest in PA. The Mediterranean diet has been the gold standard dietary pattern for decades, and with good reason: it has been linked with lowered risks of cardiovascular disease, cancer, diabetes, and Alzheimer’s. But scientific research has found that animal products—including seafood, poultry, eggs, and dairy (which are all a part of what we think of as the traditional Mediterranean diet)—are associated with excess weight, chronic disease,and ecological degradation. Now, Julieanna Hever, R.D. – registered dietitian and plant-based expert – transforms the Mediterranean diet into the “Vegiterranean” diet with whole-plant foods. The Vegiterranean Diet more effectively promotes long-term health and weight management than the common Mediterranean meal plan. With Vegiterranean meal basics, nutritional concerns, flexible menus, and more than forty easy, delicious recipes, you’ll reap the benefits of the most researched and beloved diet—made even healthier. Officially titled The Vegiterranean Diet: The New and Improved Mediterranean Eating Plan–with Deliciously Satisfying Vegan Recipes for Optimal Health this book is available for pre-order NOW on Amazon and your favorite bookseller. Once you complete the form below, you will be sent a confirmation email. You must click on the link in that letter to confirm your request. Then the information will be sent to the email you have provided. You will also receive a gift subscription to the Healthy, Happy, and Fit news and updates and you can unsubscribe at any time. Then, you will be able to go directly to the webcast link provided and enter your questions for Julieanna today – or simply post your questions in comment below or on my facebook page here: http://www.facebook.com/lanimuelrath. 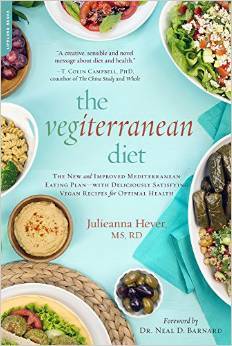 More About The Vegiterranean Diet from author Julieanna Hever, R.D. The Vegiterranean Diet puts nutrition and health into global and historical context. In an informative and engaging way, the book is a mashup of all that is fabulous with the Mediterranean diet, debunking myths, and defining why and how the most perfect diet has developed over time. 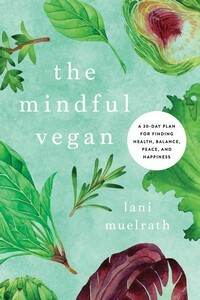 Front-loaded with history and science, then introducing ecological and psychosocial perspectives, the book leads up to ten basic principles, a Vegiterranean Food Pyramid and Plate, a comprehensive 21-day meal plan, and 66 delicious, nutritious Med-style recipes. I am thrilled to announce that my new book, The Vegiterranean Diet, has its official cover and is available for pre-saleon Amazon.com and on Barnesand Noble.com…it officially publishes on December 23rd, but you can order a copy now! The Vegiterranean Diet: The New and Improved Mediterranean Eating Plan–with Deliciously Satisfying Vegan Recipes for Optimal Health puts nutrition and health into global and historical context. In an informative and engaging way, the book is a mashup of all that is fabulous with the Mediterranean diet, debunking myths, and defining why and how the most perfect diet has developed over time. Julieanna Hever, M.S., R.D., C.P.T. is a Registered Dietitian and the host of the new talk show series What Would Julieanna Do? on Veria Living Network. Julieanna is the author of The Complete Idiot’s Guide to Plant-Based Nutrition, co-author of The Complete Idiot’s Guide to Gluten-Free Vegan Cooking, and the nutrition columnist for VegNews Magazine. 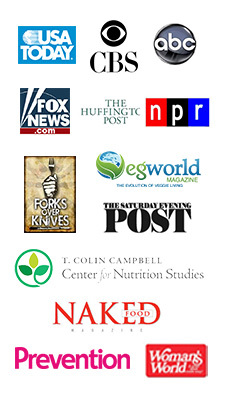 Julieanna served as a Special Consultant for the documentary Forks Over Knives and contributed recipes to the New York Times bestselling Forks Over Knives books. As the Executive Director of EarthSave, International, Julieanna brings whole food, plant-based nutrition to the forefront of efforts to improve the current global health crisis. Julieanna has been featured on The Dr. Oz Show, The Steve Harvey Show, The Marie Osmond Show, Reluctantly Healthy, and E! News; she co-stars on The Chef and The Dietitian and lectures extensively throughout the United States. Certainly Alan! Hope you’ll be joining us on the call. I’m having a real hard time losing the weight I put on a few years ago. I started out following Mcdougall Furmann and now have a library of asst. 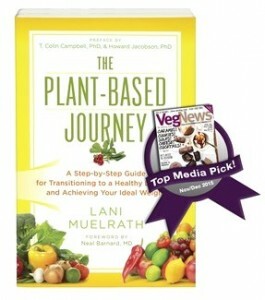 plant based books. I love this way of eating, Potatoes br. rice peas corn warms my heart.I.m just really getting frustrated why I can’t slim down,when all the books I read and the blogs I follow claim how easy and effortless it is to do. Scroll to the bottom of the page and read some of the discussion topics. I received several emails when this was published on the very topic you present. Is this a question for Julieanna, or me?